Okay. I have rewritten the opening of this post a million times, unsure of where to begin. I’m sure it won’t come as any surprise when I say that life following the debut of my novel, GOOD THINGS (Berkley Books, Feb 2007), was anticlimactic. Every author tells you this: they wake up on the morning of only to discover that they still have the same bad hair and dirty laundry piling up in the hamper (if they even bothered to put it in the hamper). If you’re lucky, your family might put out a huge vase of roses and write a lovely congratulatory note (as mine did) and then proceed to ask you what’s for breakfast and what are we going to do today because yesterday was SO boring. And then you think, yeah, yesterday was boring, tomorrow may be boring, but today I rock the world — my book just came out! I will admit that I did my fair share of ranting about what did or did not happen with my book, about the publicity or lack of publicity for my book, about the foreign or dramatic rights or lack of said rights, and that I had the occasional pity party because nobody seemed to love me, but the truth is I had finally, and officially, kicked off my writing career. The book was out there … forever! I was in the Library of Congress … forever! And in this new digital age, this post will probably be around … forever! It was, and still is, a pretty heady feeling. And I am grateful. I have just finished the manuscript for TABLE MANNERS (Berkley Books, Aug 2009) and after we get SWEET LIFE (Berkley Books, Sept 2008 – next month!!) out the gate, I am going to start on book #4. Can you believe it? One moment you’re praying that an agent will say yes, then you’re praying a publisher will say yes, and then … they say yes. And then you’re writing books and getting published and talking about deadlines and that your editor said this and your agent said that and somebody who’s friends with somebody who saw Jodi Picoult at Whole Foods thinks your book is great. So for those of you who are published: let’s embrace and enjoy it. It’s a good life. And for those who are working towards publication: don’t give up. It only takes one “yes” for things to change forever. And for those of you who are reading this post because you’re excited about the release of SWEET LIFE and want to know what kind of fun things I have planned, here’s the 411: (1) I have an amazing gift basket giveaway going on (25 baskets valued at $80 each! Chocolate! Cookies! Signed books! Keepsake basket! No purchase necessary to win though I sure would appreciate it! ), (2) I will be doing an exciting email campaign and blog tour on Sept 2nd that you won’t want to miss (sign up for my newsletter to get in on it), and (3) I have a website revamp planned with a few bells and whistles (look for an announcement in an upcoming News Flash). Other than that, it was great to come back to the Ball and I truly wish the current Debs and incoming Debs much success with their books! I can’t wait to read SWEET LIFE. I loved GOOD THINGS, and know you are on the path to a wonderful career. Congratulations! I love the cover to Sweet Life, btw. I’m glad you said this about being published. I think lots of authors downplay it — and for good reason, it’s not Paradise all the time and it’s only too easy to idealize — but there’s a reason we’re all striving for it and when it’s finally here, why not revel? Mia, you are so right. All it takes is one yes. I know of an author whose agent totally nixed his book. This after he’d published several already. Agent HATED it. So the author took it to another agent, who LOVED it. The book sold for more money than I will EVER see in my lifetime…Best of luck with your ongoing fabulous successes! You know I’m crazy for you and your books. Can’t wait to see Sweet Life! Mia, with your mind coming up with a new idea every minute, you’ll always enjoy the good life of writing AND the best life with your family. I’m packed and ready for my reading escape in SWEET LIFE, hope Amazon ships early! P.S. I had to smile when noting that the GOOD THINGS’ sequel is no longer TABLE MANNERS but TABLE LIFE. 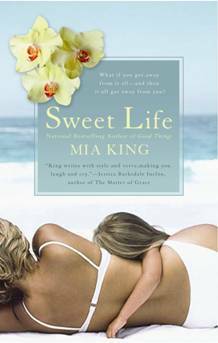 Mia, congratulations on the impending release of SWEET LIFE! I can’t wait to read it. And Mia’s here! We are almost complete this week! As you already know, I also LOVE your cover and can’t wait for SWEET LIFE to come out. This was another great update and they continue to make me all nostalgic. Looking forward to Eileen tomorrow, and then me, and THEN?! Holy moly, it’s gonna be a third year of Debs before we all know it. Kristina, those dancing shoes fit you perfectly. Welcome again to the Ball! Jenny, I love stories like that — they’re so encouraging. Thanks for sharing it! Eileen, ditto, but you already knew that! Larramie, now you know how tired I am — I can’t even get my book titles straight! It’s supposed to be TABLE MANNERS. Doh! Kristy, this Ball wouldn’t be what it is without you. Three years of Debutantes? And we’re kicking a**! You are so, so right. This is the good life. It’s amazing to be able to do this, to write words and know that they’ll be out there forever, that somehow we’ve earned the stamp of approval from the Library of Congress (that goes on our permanent record, right???) Thanks for the reminder. I’m excited to read your new book! Thank you, Trish! That Library of Congress thing was huge for me! It is forever, which is amazing! This sounds like the GREAT life! Thanks for putting it out there! Thanks for getting us up to date and I can’t wait for the next two books! Gail and Danielle, this is just the beginning and I know there will many more books for you both! The fear is always there, which helps keep us humble. I grappled with it again the other day, debating whether or not to sell on synopsis vs finishing the book — the latter usually gets you a tad more money, but what if the publisher doesn’t want it and you have a manuscript you spent months writing? At least on synopsis I know the book is in the pipeline, but the money’s not as good and for me the creative process is stifled a bit. Then again, it adds a layer of discipline that might be good for this easily distracted mom. Then again, who needs the stress? So you see the debate always continues in one way or another even after your Deb year, but it’s all still good and I can tell you that if you got this far, there’s still a long way for you to go! Here’s to a long and fruitful career for all writers out there!